Let’s start by discussing your very well received set at Latitude Festival earlier this year, do you see yourselves (as a result of the new album ‘V’) being able to reach new audiences at festivals like that? We’ve always been lucky enough to be booked for all sorts of places around the world. To be honest, I gave up on thinking about that kind of thing a long time ago, I just figured that the only important thing really is to be satisfied with what we’re doing and that stuff isn’t important to me anymore. It’s not about a lack of ambition either, I’m just not bothered about ‘getting bigger’. I’m happy playing decent shows. Even if it’s about 2,000 people in every town, because that size of crowd can maintain the intimacy of a smaller gig. I don’t enjoy stadium gigs… well I enjoy playing them, but not watching them. It’s really refreshing to hear that because it means that you’re comfortable with your creative process. So many bands now have the sole ambition of ‘getting big’. People make sacrifices, but they don’t always work out. And they’ll regret it, because they’ve made a record which isn’t quite what they wanted and then 10 years later, they’ll look back and think ‘What was it for?’. I am comfortable with what we’re doing and I’m really happy with what we’re doing. 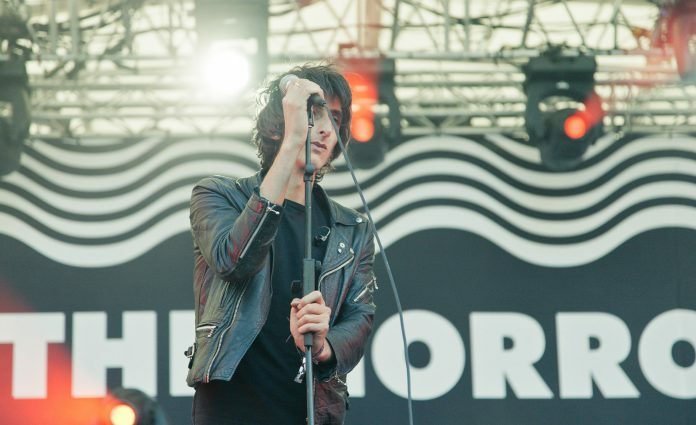 It’s interesting then that a lot of the talk surrounding the new album has been about The Horrors ‘getting to the big time’, is it quite annoying to hear that sort of conversation about your band? In a way, it is our most accessible record, but it’s almost an accident. No matter what genre of music you’re making, if you do it well, you can reach people. Even if you’re not particularly into that genre, you can appreciate great artists. The goal or aspiration for any band has got to be to make great music which you think is going to last. That’s what we aim to do. What makes it your most accessible record ‘by accident’? I don’t think we made any compromises. Things fell into place where we were working with a producer (Paul Epworth) who’s been very successful in the pop world, but he’s been making underground records at the same time for years. We’re on his label now and he wanted the chance to work on something where he had free rein and something that would be a bit more experimental. It was nice not to have to answer to anyone, because it’s his label. It did seem like a match made in heaven! You’ve spoken about being signed to his label, Wolf Tone, but you were originally signed to XL – so did you leave that label? Or did something else happen? Well they offered us the contract to do another record, and we’d already had a 3-album deal with them over a period of about 9 years. Richard Russell, the guy who started it, is brilliant. He’s really, really gifted. We had our own studio as well, but we decided to work somewhere else for this record. I didn’t want us to become too comfortable with the whole process of making a record. Personally, I work way better when I’m reacting to things that are unfamiliar. I believe that I’ll still be making music in 10 years, and I hope that everyone else in The Horrors will be too. Josh and I recently made a pact that we were ‘Horrors for life’, which was very teenage of us [laughs] Whether The Horrors are still going in 10 years or not, and I hope we are, we’ll have to keep making sure that the working conditions change on every record. That’s what we’ve done on most of our records in the past, and the records we aren’t as happy with are ones where we didn’t change our working conditions. Previously, you’ve mentioned that ‘Luminous’ is one of your albums that you wish you could change, why is that? I felt that a lot of the demos on that album were quite good, but I think we tamed them a bit too much. I think what makes you a really good band to be a fan of is that you’re so honest and approachable. You post a lot on Facebook, so that made a big difference when we were waiting between ‘Luminous’ and ‘V’, because we knew you were still active and still doing things. Though I have to admit I wasn’t sure what you were doing clearing out all of your stuff! I think it’s good to do that every few years, I’m a compulsive hoarder, so if I don’t clear stuff out then I’ll accumulate some really useless things. My mum is even worse than I am though. Now, there’s a GIF of you jumping into a crowd feet first a few years ago, and a lot of people seem to think you tried to crowd surf and failed, but I think it looks like you just wanted to get into the crowd and walk around. What’s the truth? Finally, what music have you been listening to this year? When we’re making music, I don’t listen to any other music, because there’s not much space left in my head… So I’ve only been listening to classical music really, Rachel from Cat’s Eyes has introduced me to most of it, stuff like Górecki, Satie, Elgar. I’m really enjoying listening to it!